Next week's Democratic National Convention will kick off on Monday, as the party is expected to come together to officially nominate Hillary Clinton as their general election nominee. However, given that Republican National Convention attendees staged a last attempt at ousting Trump earlier this week, it would be wise to consider whether the same could happen at Philadelphia's DNC. Specifically, can Bernie Sanders become the nominee at the convention? Technically, Clinton is still a presumptive nominee, and if we take another last look at the candidates' delegate breakdowns from primary season, Clinton holds 2,205 of the necessary 2,383 for the nomination, and Sanders holds 1,846 delegates. So yes, either way, Clinton is still in the lead. And yes, Sanders did endorse Clinton earlier this month, but the DNC could be a final attempt at contesting Clinton's nomination — just like the RNC presented a similar opportunity for the "Never Trump" camp, including Ted Cruz, who basically told the convention floor not to vote for the party's nominee. Sanders has not released his delegates just yet and has planned to meet with them ahead of Monday's convention, which could actually signal a step toward unifying the party, rather than the opposite. 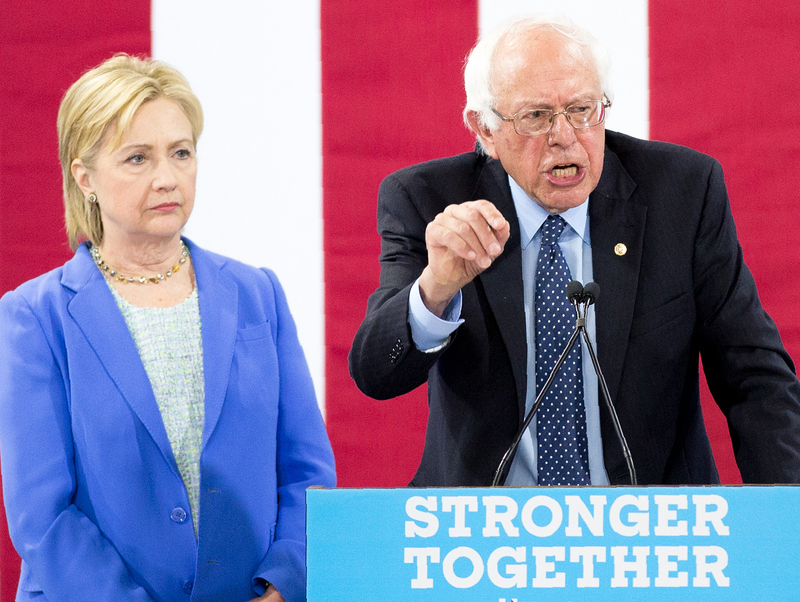 According to Fortune, holding on to his delegates has allowed Sanders to continue pushing his agenda, perhaps also prompting Clinton to push her platform to the left. So while, in theory, it may be possible for Sanders to become the nominee, it's highly unlikely. However, that doesn't mean that another important movement won't make its way to the convention floor. This year's general election nominees are not necessarily the top picks for most American voters. According to a RealClearPolitics average, Clinton's candidacy holds a 55.9 percent unfavorable rating, and Trump's average is 59.1 percent unfavorable among American voters. FiveThirtyEight even noted that their strongly unfavorable rankings are record-breaking in a presidential election. But what can happen to change that? The most valuable way to ensure changes in the future would be a complete overhaul of the nominating process. The selection process within parties needs to be reformed — an issue that Sanders made central to his primary campaign. If there has ever been an election year that made that clear, it's this one. Throughout the 2016 election primaries, superdelegates sided against their state's voters more than once and even pledged their support for a given candidate before their state voted, making it clear that voters within particular states barely had a voice. Voters want to change that. Ahead of the DNC, a coalition of 14 progressive groups — supporters of both Clinton and Sanders — came together with a proposal to end superdelegates. The coalition's call to end superdelegates states that "the will of the voters should be decisive in determining the Democratic nominees for the country’s highest offices. But the Democratic Party's "superdelegates" system means that insiders could overrule the voters." In an open letter to the DNC, the coalition writes, "The superdelegate system is unrepresentative, contradicts the purported values of the party and its members, and reduces the party’s moral authority." According to the New Republic the coalition will call for the nominating process of Democratic candidates to only include primary voters, and is another hit at the Democratic establishment. So even though Sanders as a representative will not become the nominee at the convention, the ideals and platforms of his campaign are expected to cause a storm in favor of changing the Democratic establishment and the nominating process in the future. So it would be more like adopting Sanders' platforms in favor of changing the party as a whole. The next step would be opening up all primaries to include independent voters, and replacing caucuses with open primaries. For anyone who is absolutely set on voting for neither Clinton nor Trump, there are ways to cast a ballot this fall without ensuring a Trump White House.